Chicago hosts the second largest Mexican community in the United States after Los Angeles. Between 2010–2014, 669,000 Mexican migrants resided in the metropolitan area, representing 7% of the total population and 40% of the foreign-born population. Unsurprisingly, scholars and observers alike adopted the idea of a “Mexican Chicago.” Contrary to what some might think, however, Mexican Chicago is more than the mere presence of Mexicans in Chicago. As Nicholas De Genova argues, Mexican Chicago is produced through migrants’ everyday-life practices, which tie this space irreversibly to Mexico and, at the same time, render it irretrievable for the US nation-state. This is not to say that Mexican Chicago pertains to the Mexican nation-state. Rather, says De Genova, it is the result of migrants’ particular social situation through which the meaning of “Mexican” itself comes to be reconfigured. Thus, Mexican Chicago has to be constantly reworked and reproduced through social interaction. Few spaces are as emblematic of Mexican Chicago as the numerous Hispanic soccer leagues that exist in the city. A steady stream of new Mexican migrants after World War II, combined with soccer’s dramatic expansion south of the border, led in the 1970s to what David Trouille calls the “Latinization” of the game. The foundation of the Chicago Latin American Soccer Association (CLASA) in 1973 was followed by the exponential growth of Mexican soccer in the next decades. According to Raúl Dorantes and Febronio Zatarain, the main four leagues average 7,000 members each, but the total number of registered players in the Chicago metropolitan area is close to a quarter million. 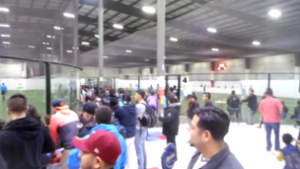 So how does one experience Mexican Chicago through soccer? The answer is not straightforward. My fieldwork with San Rafael, a Chicago-based team founded by migrants from a rural town of the same name in Michoacán, reveals how varying sets of relationships and situational factors can alter the meaning of “Mexican” in Mexican Chicago. A very brief comparison between the summer and winter seasons proves illuminating in this regard. 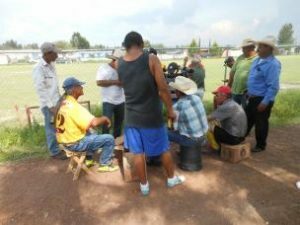 An atmosphere largely reminiscent of rural Michoacán characterizes the summer season games. Although many players are of the 1.5 and second generations, 1 most supporters are first-generation migrants who have lived several years in the United States. As Luis Escala-Rabadán points out, participants “reconstruct their place of origin” through the soccer experience despite being far away from it. For example, since the heat in both San Rafael and Chicago is usually intense, attendees north and south of the border congregate under the trees to seek refuge from the sun and chat. In both locations, Mexican snacks, chicharrones, are available for purchase on the sidelines of the field. Whether in Chicago or San Rafael, most participants also enjoy a few beers while watching the game, and drinking continues for hours afterwards. Moreover, soccer games in both sites pit teams that represent specific towns against each other, which reinforces a sense of pride among participants. Finally, in both Mexico and the United States conversations are in Spanish. At la Pershing, the facilities where the San Rafael indoor soccer games take place, things are different. 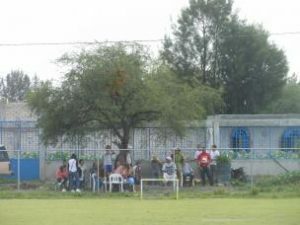 The first-generation supporters from the town are mostly absent, and players are predominantly of the 1.5 and second generations. Still, the space is filled with Mexican features. As one enters the premises, the booming Mexican music can be immediately heard. The majority of players wear Mexican teams’ jerseys, and the multiple screens show the Mexican soccer league on Univision, a Spanish-language television network. Next to a cash register there is an image of the Virgin of Guadalupe, another conspicuous symbol of Mexicanness. 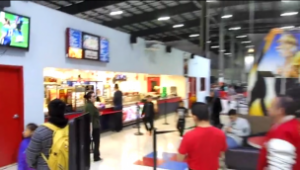 However, instead of vendors selling chicharrones, there is a fast food restaurant where customers can buy American food such as hot dogs, popcorn, and nachos. Whereas the use of English is extremely limited in the summer, the norm at la Pershing is a combination of both languages. On and off the soccer field, continuous code switching between Spanish and English soon becomes apparent. There is also a store where people can acquire sports equipment. When I walk in and ask for shin guards in Spanish, the clerk asks me to please repeat my question in English, as she cannot understand. It then dawns on me: this is just another face of Mexican Chicago, no less Mexican than the one that emerges during summer season games. As a 1.5-generation player told me, this is an opportunity to feel “more Mexican” as opposed to feeling “more American” while at work. 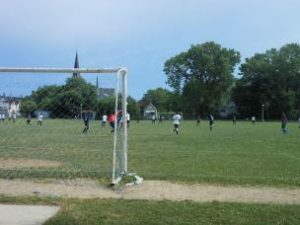 In sum, although the San Rafael soccer team is doubtlessly embedded in Mexican Chicago, its meaning varies significantly in different settings and according to the actors involved. However, this is just the first step of the analysis. As Lisa Wedeen argues, the importance of these practices does not reside simply in what they mean to their practitioners, but also in the ways in which they produce specific logics and generate observable political effects. That is, precisely, the goal of my research. De Genova, Nicholas. 1998. “Race, Space, and the Reinvention of Latin America in Mexican Chicago,” Latin American Perspectives, 25: 87–116. Dorantes, Raúl and Febronio Zatarain. 2007. …Y nos vinimos de mojados: cultura mexicana en Chicago. Mexico City: Universidad Autónoma de la Ciudad de México. Escala-Rabadán, Luis. 2012. “Migración, redes sociales y clubes de futbol de los migrantes hidalguenses en Estados Unidos.” In Offside/Fuera de lugar: futbol y migraciones en el mundo contemporáneo, edited by Guillermo Alonso Meneses and Luis Escala-Rabadán, 133–150. Tijuana: El Colegio de la Frontera Norte. Trouille, David. 2008. “Association Football to Fútbol: Ethnic Succession and the History of Chicago-Area Soccer since 1920,” Soccer & Society, 10: 795–822. Wedeen, Lisa. 2008. Peripheral Visions: Publics, Power, and Performance in Yemen. Chicago: The University of Chicago Press.